How many subscribers a day can you expect to achieve with a comprehensive directory/announcement listing campaign? What is the true cost per subscriber? Which ezine directories are most effective? 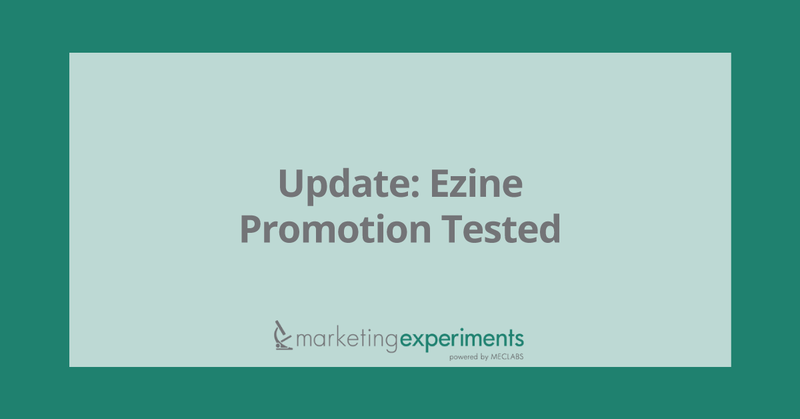 How difficult is it to get your ezine included in a review site? Which directories are still being well maintained and which directories are being neglected by their webmaster? What are a the top 3 announcement lists? Does it pay to list your ezine with Yahoo! Groups? You can view the full experiment here. Our initial results were uniformly dismal. We reported that a full 66% to 68% of the sites to which we submitted failed to respond to our efforts. Many of them were outdated, and poorly maintained (we list each site in the main article). After 30 days, we could only identify 120 new subscribers, acquired at a cost of $5 a person. It was ugly. You cannot measure the true return of the directory sites within a 30-day period. Though our current costs can be calculated at $5 per subscriber. Over time, this number can be significantly reduced. If we maintain a rate of 3 new subscribers per day, and if we amortize our expenses over 12 months, our effective cost drops to just $0.55 per new subscriber. How cost effective was this campaign? How accurate were our projections? As far as we can determine, we have achieved approximately .17 subscribers per day who — have signed up using the email link within the directories. There are another 33 visits to the web site through the directories… from which it is reasonable to assume that we have acquired another 10 subscribers. This indicates that the directories are yielding .33 subscribers per day. The “decay” rate is inordinately high. Many directories sort by date. As new submissions are added, your ezine can become “buried” too deeply within the listings. You need to resubmit at least once every 90 days. This is not especially time consuming when you are focusing on just a few key directories. There may be an indirect benefit from the listings, which is hard to measure. It can be argued that you can gain key subscribers who link to your site, recommend you, etc. We may have achieved another 100 subscribers, indirectly, from our listing efforts. How many new subscribers could you expect gain if your publication were featured in a major ezine? It is interesting to note that this single publication sent 157% more subscribers than all 36 directories, review sites, and announcement lists, combined. And while the former results were based on just 5 days exposure, the latter results were based on 90. Submit to the KEY directories, and announcement lists as defined in the main article… BUT focus on developing a publication with such rich, original content that it attracts interviews, publicity, and links. What about posting strategic messages in discussion groups? Can you attract subscribers with your “signature”? Dr. Mark Brownlow is a leading authority on ezine development. Dr Brownlow has earned degrees from Reading, Aberdeen, and Oxford. He is a frequent contributor to the online periodicals at: http://www.ibiznewsletters.com. I’m sure you’ve already considered this, but perhaps you could tackle the realities of forum and discussion list postings as a marketing measure. We did some intensive postings using unique URLs to track the number of page views and subscribers generated and were quite disappointed with the results. We were posting solid, regular contributions (our opinion!) to 100,000+ subscriber lists with a fairly on-topic audience and getting near-zero results. We’ve not properly evaluated the method, as we’ve had other things to do…. But my tentative conclusions were that you need to pick your venues very, very carefully, and that discussion posts may be better as a means of building a reputation (which will have benefits when it comes to customer acquisition), rather than a means of driving direct traffic to your website. We are still testing this approach, but I would (tentatively) add that discussion groups may be more effective when you are marketing a “high-ticket” product or service. They can be a good tool for building credibility with key prospects. What about submitting articles, en masse, to “content-hungry” ezines in the hopes that you will be published and attract subscribers to your URL? Rob Cross is an Internet Marketing Consultant who experimented with this very concept. Here is a note we recently received from Rob. I am an Internet marketing consultant. I have achieved numerous good rankings with Yahoo. One of my top spots with Yahoo was for the number two money industry in the United States. I wrote an article briefly describing how to get a decent ranking with Yahoo, and also notifying people about their new sponsored sites service, describing how to sign up. I sent this article to about 100 business and marketing ezines that said they accept articles. As far as I know it was printed in only three. One of these is one that I am a member of and have been posted in before. I received maybe 10 or 15 extra visitors a day (for a couple of days) when I was posted in… I-Sales …I think I had maybe one-person sign up for my ezine. … I was very disappointed that my “web site counter did not break from so many visitors…” (as I had been promised). So what can you do? How can you build your subscriber base? Our Team is experimenting, at present, with co-registration, (highly) targeted pay search ezine buys, popup windows, strategic syndication, and some new, highly unorthodox approaches. By the way, this is not a paid advertisement. We just think Brian is an effective writer with a lot of relevant experience. And experience matters — there is something to be said for the intangible momentum that comes with longevity. Successful publishers just “keep on keeping on”. #060501-EBK – What is the most effective way to market an ebook? Which approach will produce the most results: offering sample chapters in a two-step sales process or offering a single detailed presentation with a one-step sales process? Does long copy still work; does it only work for a specific type of prospect? What conversion rate can you expect from a targeted, pay search engine buy linked to the title of your book? What about secondary sales, update sales, ancillary sales – how can you increase the lifetime value of customer? #070501-AWA – We study 600 awards sites to test and select the top performers. Can you attract traffic by winning recognition? What does it take to win? How do you prepare your site? What is the easiest way to submit? Opt-In Subscriber Buys Tested – What Is True Quality Of Incentivized Subscribers (as measured by conversions ratios)? “Tell-A-Friend” Email Forms Tested – Do They Really Incentivize Referrals? Page Optimization Tested – How Can You Design Your Page To Achieve The Highest Yield Per Visit? Sweepstakes Tested – How Can You Combine A Product Giveaway With A Series Of Carefully Prepared AutoResponder Messages To Increase The Value Of Your Unique Visitors? Email us with your comments and let us know which experiments you would find most helpful. Pieces written by our editorial staff are generally a collaborative effort. Please see the credits in the body of the content to view authors involved.